I remember Paris and I’m not alone. Share your 2-euros? Happy? Don’t worry, I was! This weekend in NW Traveler, The Seattle Times took readers on a trip to Paris along with me, with my travel-savvy pal Carol Pucci offering a taste of the North African accented Saint-Denis, our Windy City colleague Bill Daley providing his take on Paris restaurants not yet trammeled by tourists, and me trodding the cobblestones of the touristy (but no-less-beloved) rue Cler. A room (mine, right) with a view, of the classic French bistro, d’Chez Eux (holding down the streetside corner of the building at left). I still remember my first sight of rue Cler — the Paris market street canonized by European travel guru Rick Steves, idolized by tourists and beloved by lucky denizens of the 7th arrondissement who call its well-trod cobblestones their own. One look and I cried real tears. Why? Because it was my first trip to France, spring was in the air and my husband-to-be and I had rented a studio apartment — with a kitchen! — here in Paris’ answer to our own Pike Place Market. A winter welcome on rue Cler. Far less misty-eyed on a visit to rue Cler this winter, I found myself still as enamored of this marvelous market and its surrounding Left Bank neighborhood where schoolboys (and girls) zipped around on their Razor scooters, working men lifted glasses at corner cafes, and chic matrons clicked their heels past me, disappearing into the hidden courtyards, their housekeys — and the inevitable baguette — in hand. The 7th is home to the Eiffel Tower, which cast its long shadow over the Hotel Duquesne Eiffel. There I hung my hat — and hung out on a balcony for a golden view of the chapel dome at Les Invalides, part of the historic military complex that helps define the neighborhood. My room also provided a view of d’Chez Eux — the auberge where dinner begins with complimentary charcuterie, and a whole Bresse chicken is expertly carved tableside by a friendly English-speaking maitre d’hotel. Bresse chicken with fresh morel mushrooms, at d’Chez Eux. A short walk from the hotel, the bustling rue Cler remains a pedestrian’s paradise of cheese shops, bakeries and butcher shops. Here you’ll find cafes and bistros with tables indoors and out, and every step seems to offer something irresistible — chocolate, pate, le sandwich — to sample right now, or savor later. These few short blocks, closed to traffic, are as popular with the locals who flock here Sundays after church as they are with the tourists. 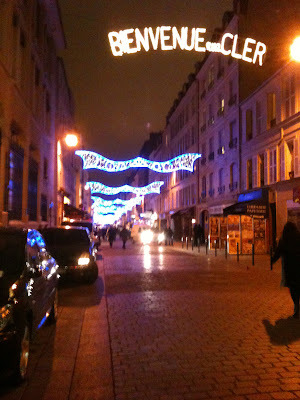 No, I didn’t have sushi on rue Cler — but I could have. On foray after foray I feasted with my eyes, making the rounds of rue Cler’s many shops and stalls, passing bushels of oysters — among them huitres de Bretagne — and sidewalk slurpers settling in to enjoy them (I’d had my fill of icy oysters during a memorable meal at La Mascotte in Montmartre). You go for sweet, I go for salty. Instead, I ogled an ocean’s worth of sea treats at La Sablaise, where the fishmonger’s displays included seaweed-draped baskets full of wiggling shrimp. The sight immediately made me long for that rue Cler apartment, my 7-quart Le Creuset and time to make a proper bouillabaisse. Had I needed garlic, olive oil and saffron for an accompanying sauce, I wouldn’t have had far to go. L’Epicerie Fine: a global treasure-chest of goodies. Had your fill of French food? Rue Cler has you covered with Chinese and Japanese cuisine and — as I found out when I stopped in for a crepe at the small cafe Ulysee — Greek food. But if there’s a single shop on rue Cler that has my heart in its hands (as my cardiologist might suggest), it’s Davoli, aka La Maison du Jambon — the House of Ham. This Italian temptress was founded in Paris a century ago, and its picnic quotient cannot be overstated. Davoli — a pique-nique paradise. It was here that we became “regulars” 15 years ago during my first rue Cler stay, stocking up on salami and saucisson, terrines, seafood salads and smoked fish. Prosciutto haunches hang overhead, driving the customers’ little dogs that sniff the tile floors crazy. It was here at Davoli that rue Cler became a household name in my household. A Parisian pup, dressed for success on rue Cler, seen rooting for a treat at Davoli. “The House of Ham!” as we say in our house when we share a tidbit with our own two dogs, who’d no doubt love this place as much as we do. “Be sure to stop at La Maison du Jambon!” my husband said when he dropped me off at Sea-Tac Airport, where I (sadly) flew to Paris without him. “Bien sur!” I assured him, promising to eat well — and I did — in his absence.